The church was declared a basilica by the Vatican in 1956. 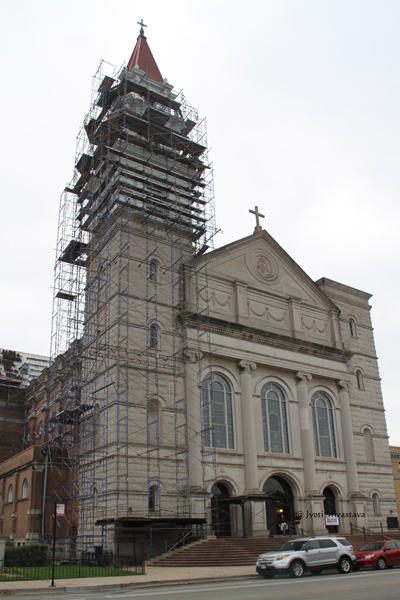 Officially named as “The Basilica Of Our Lady Of Sorrows” is a Roman Catholic basilica on the west side of Chicago, Illinois. It is located at 3121 West Jackson Boulevard, adjacent to I-290. 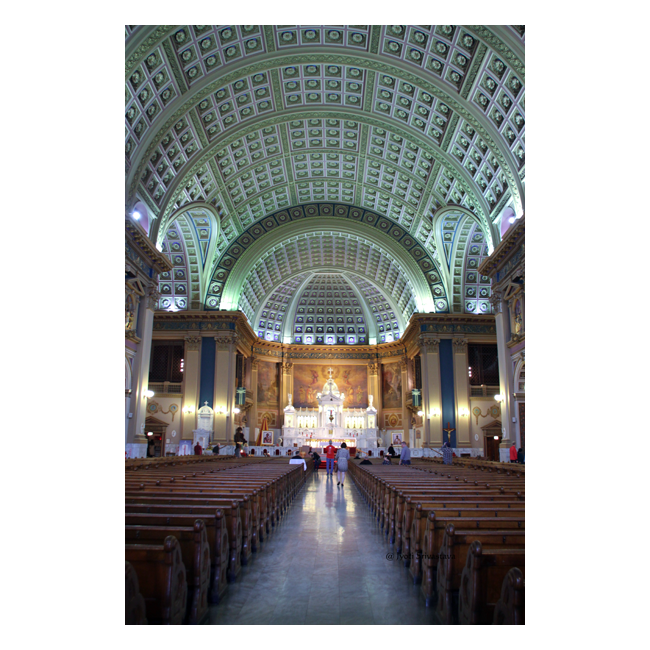 The church was designated a basilica in 1956 by Pope Pius XII, who described it as “an outstanding place of devotion in America.” Our Lady of Sorrows Basilica is one of the only three churches in Illinois designated by the Pope with the title of basilica. The other two being St. Hyacinth Basilica and the Queen of All Saints Basilica. 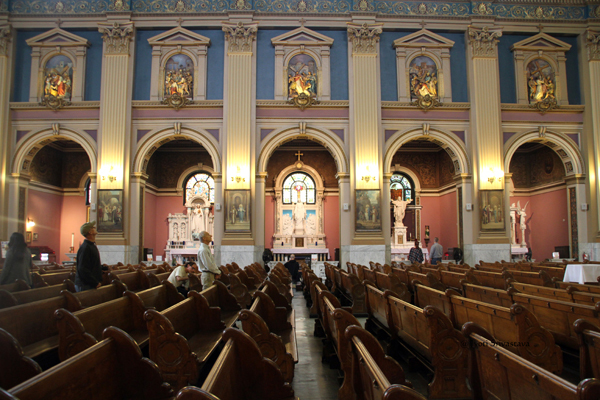 The Parish of Our Lady of Sorrows was founded in 1874 by three Servants of Mary (Servites): Fathers Austin Morini and Andrew Venturi, and Brother Joseph Camera. 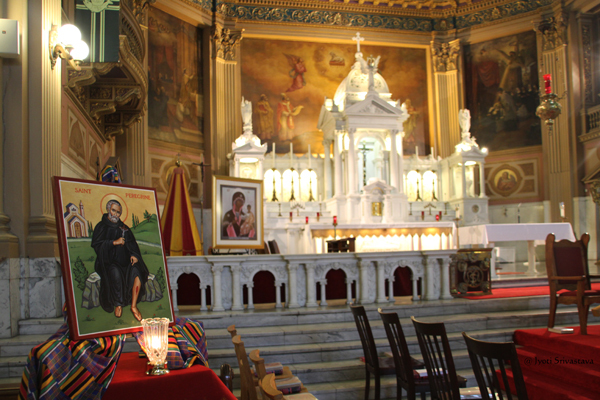 The church has been administered by the Servite fathers for its entire history. Ground was broken for the current building on June 17, 1890 and the church was dedicated on January 5, 1902. The Parish served an Irish and Italian congregation for many years. 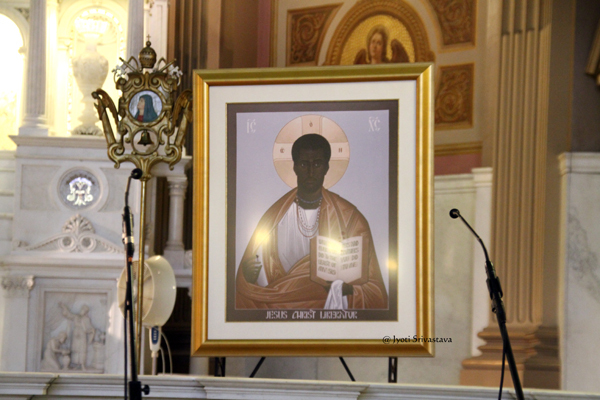 In the 1960s and 1970s the parish became predominantly African-American. Our Lady of Sorrows Basilica, Chicago. 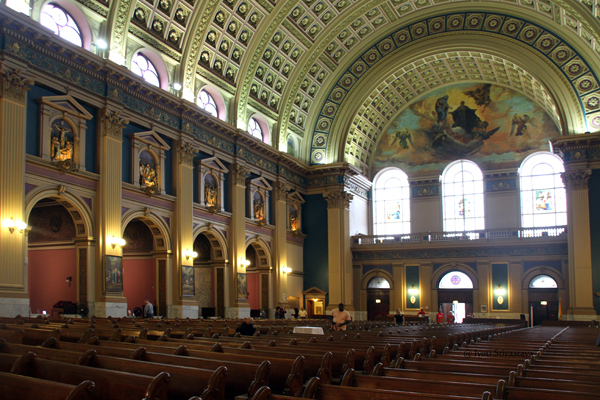 The basilica was designed by Henry Engelbert, John F. Pope, and William J. Brinkmann. The church was designed in an Italian Renaissance architectural style. The church once had twin spires, one above each tower. One was lost in a 1984 fire. 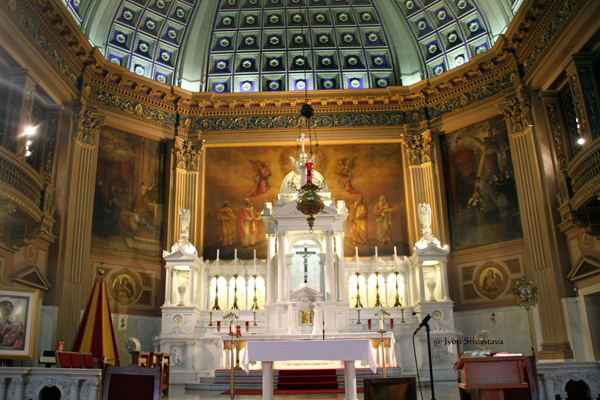 It features a barrel-vaulted ceiling that wraps around a high altar made entirely of Carrara marble. The sorrowful mother novena was a major devotion at the parish during the first half of the 20th century. The church also houses the National Shrine of St. 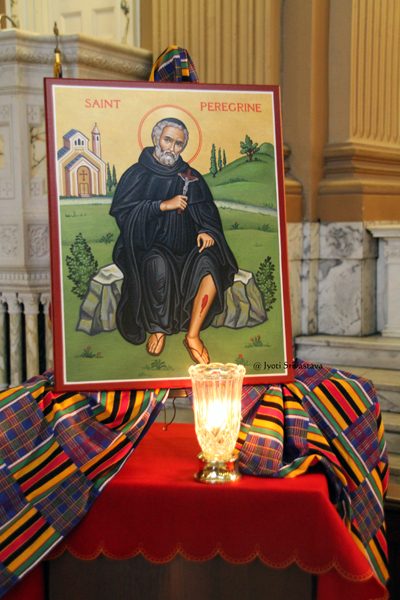 Peregrine, the patron of those suffering from cancer. 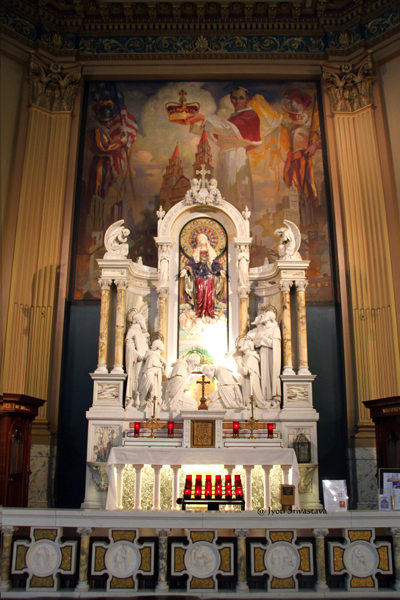 Main altar / Our Lady of Sorrows Basilica, Chicago. 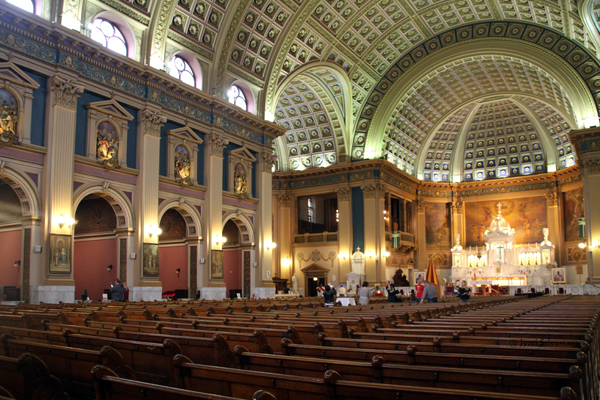 As mentioned earlier, the church was designated a basilica in 1956 by Pope Pius XII, who described it as “an outstanding place of devotion in America.” Our Lady of Sorrows Basilica is one of the only three churches in Illinois designated by the Pope with the title of basilica. The other two being St. Hyacinth Basilica and the Queen of All Saints Basilica. On the main altar one can see the Basilica Canopeum [on left] and tintinabulum [on the right side]. Churches named basilicas generally are large structures with some kind of unique historical, artistic or religious importance and offer active pastoral service to their communities. They receive the honor from the pope, and display the “canopeum,” and the “tintinabulum,” both symbols to be used when or if a pope visits. The first symbol of a basilica is the “canopeum” or “ombrellino”. In English it is more properly called the pavilion. Only churches of basilican rank are allowed to possess and display this papal emblem. It is a large ornamental umbrella with alternating stripes of bright scarlet and yellow silk terminating in scallops of contrasting colors attached to a wooden umbrella. 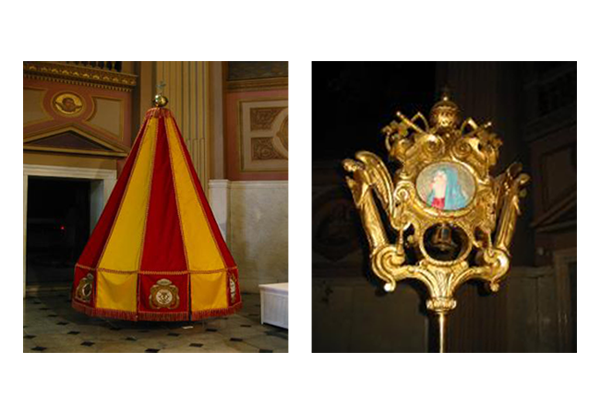 The silk canopy drapes beneath an ornate finial, a large ball topped by a cross, both in gold. The tintinabulum or basilican bell is another sign of Basilican status. Probably used in early times to announce the Pope’s arrival or a Papal procession, it is now ornamental. The small bell is enclosed within an elaborate baroque frame. The wood carving at the top surmounted by a golden cross includes the papal tiara and crossed keys. 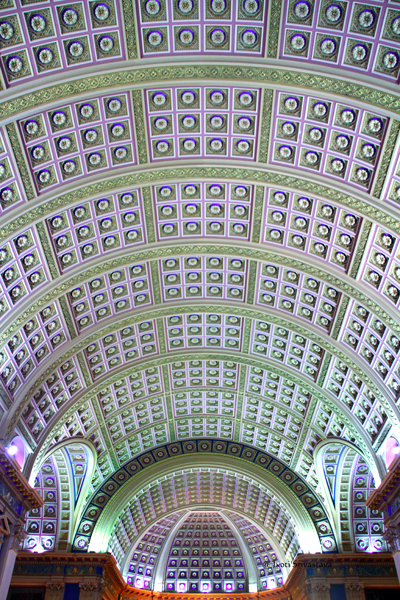 Coffered vaulted ceiling / Our Lady of Sorrows Basilica, Chicago. 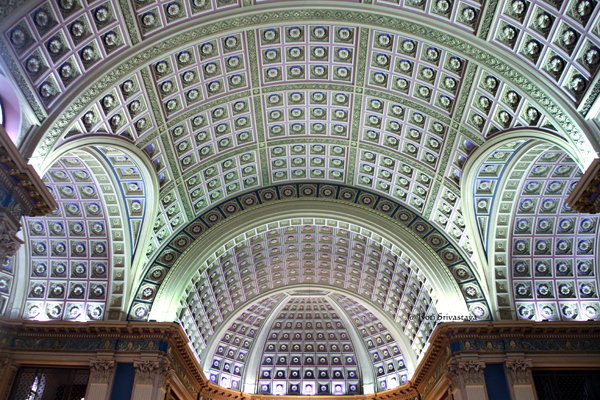 Perhaps one of the most impressive aspect of this basilica is the coffered vaulted ceiling – rich in details. 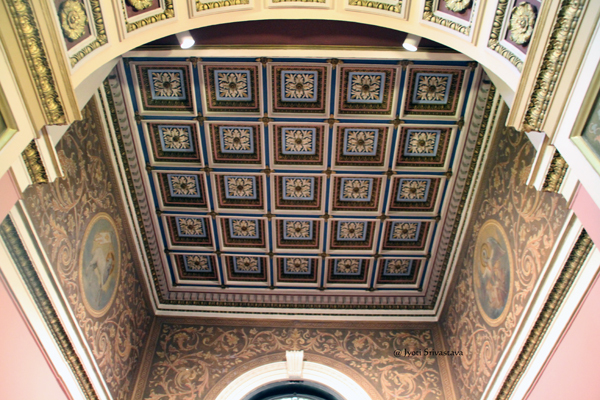 Coffered vaulted ceiling /Our Lady of Sorrows Basilica, Chicago. Coffered vaulted ceiling over one of the side altars / Our Lady of Sorrows Basilica, Chicago. 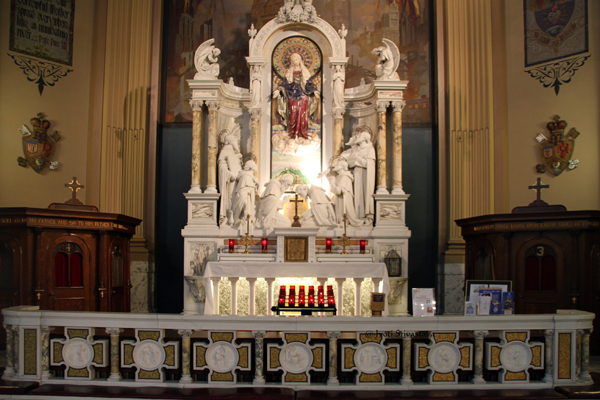 Left Transcept: The Seven Holy Founders Altar /Our Lady of Sorrows Basilica, Chicago. 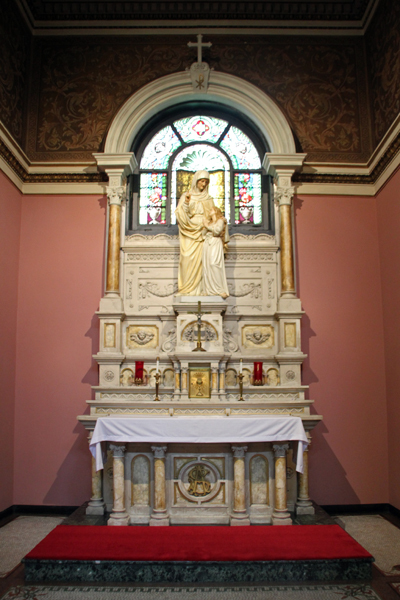 Left Transept: The Seven Holy Founders Altar / Our Lady of Sorrows Basilica, Chicago. 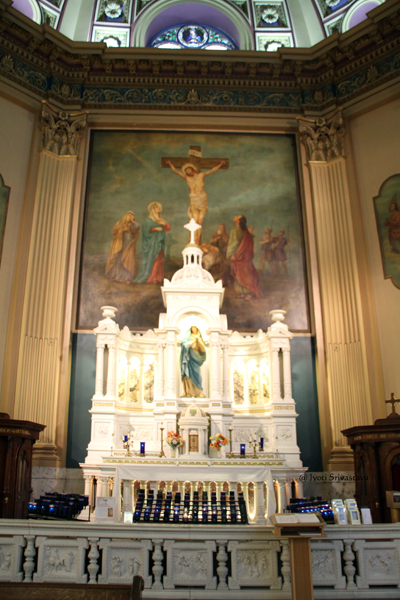 Right transept: Our Lady of Sorrows Altar / Our Lady of Sorrows Basilica, Chicago. 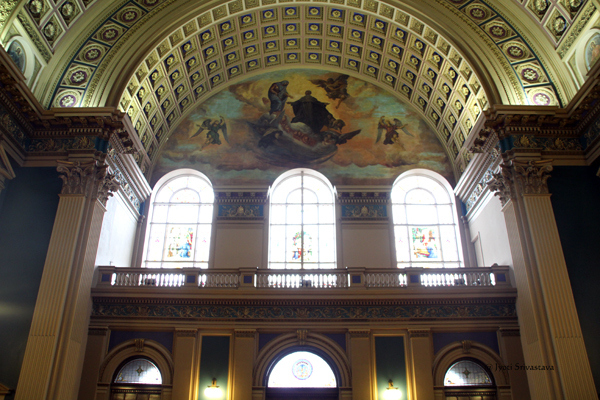 The east transept is the altar of the “Seven Holy Founders” of the Servite order.It is backed by a mural of Pope Pius XII “crowning” the church with the honorific title of basilica. The church’s two original towers are visible in the painting. 7. To the west. Our Lady of Sorrows Altar. Across the sanctuary, in the west transept another marble altar, clustered with biblical passion flower, honors “Our Lady of Sorrows”. 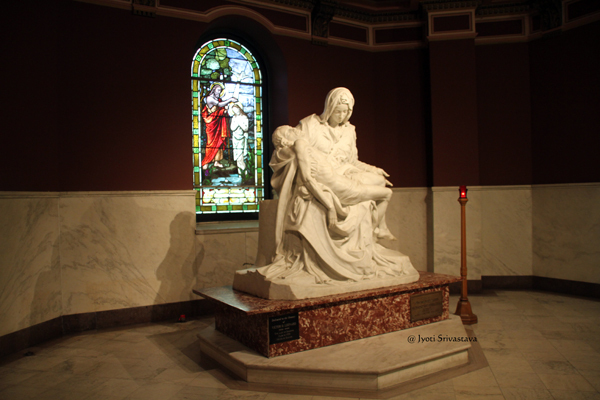 The Pieta Chapel / Our Lady of Sorrows Basilica, Chicago. 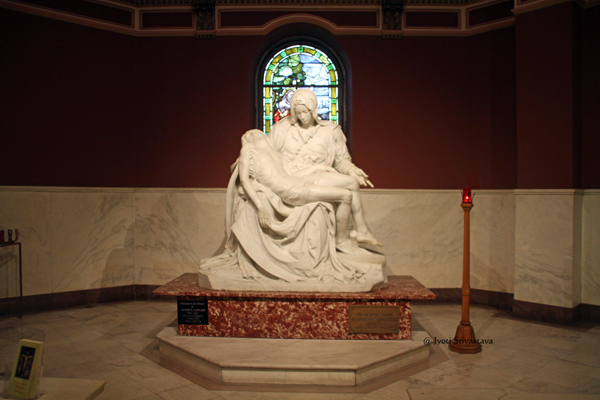 The Pieta Chapel has a replica of Michelangelo’s famous Pieta. This replica was carved in Pietrasanta, Italy in 1917. It weighs over 6, 600 pounds. The original is encased in glass in St. Peter’s Basilica in Rome. 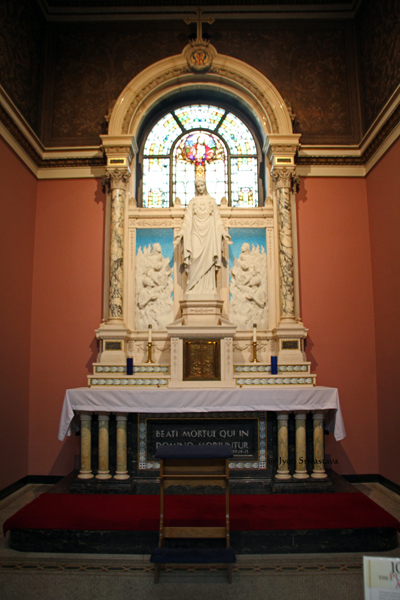 The Pieta Chapel is the site of former Baptistry. The stained glass window behind shows the Baptism of Jesus by John the Baptist. There are ten side chapels that line the nave. Five on each side of the nave. Each have their own dedication and altarpiece. 8. St. 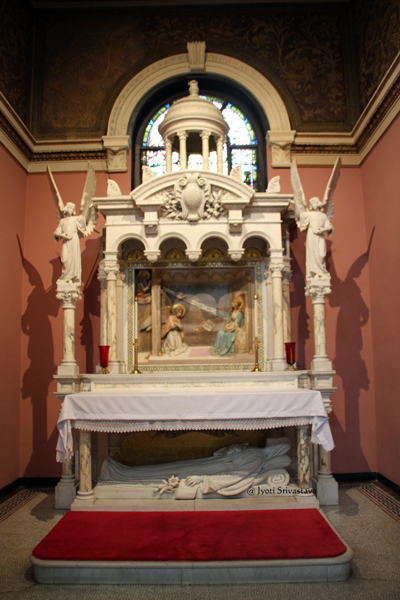 Peregrine Laziosi Shrine and Chapel / Our Lady of Sorrows Basilica, Chicago. 9. 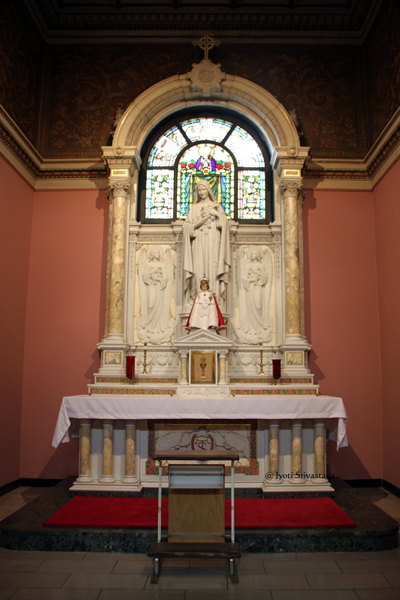 Our Lady of Fatima Chapel / Our Lady of Sorrows Basilica, Chicago. 10. 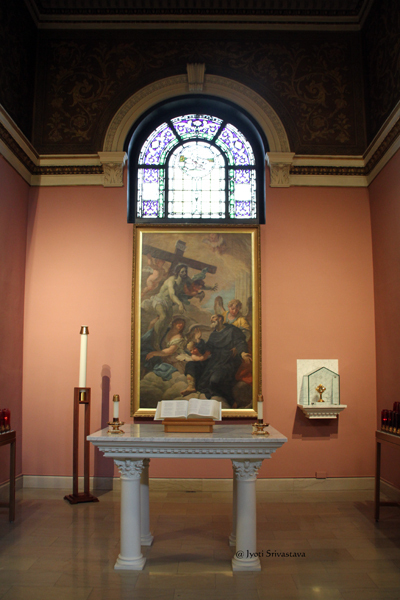 The Purgatorial Altar Chapel / Our Lady of Sorrows Basilica, Chicago. 11. 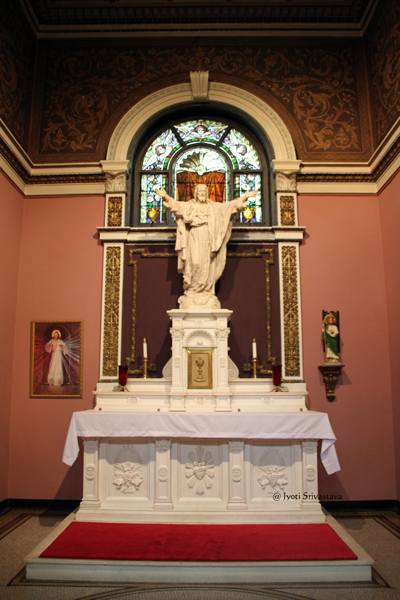 The Sacred Heart of Jesus Chapel / Our Lady of Sorrows Basilica, Chicago. 12. 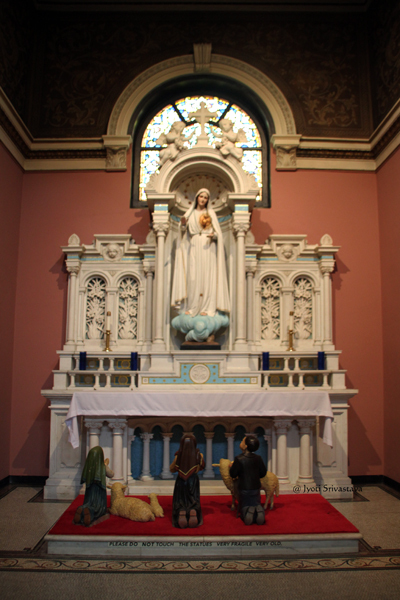 St. Juliana O.S.M Founders of Servile Sisters Chapel / Our Lady of Sorrows Basilica, Chicago. 13. 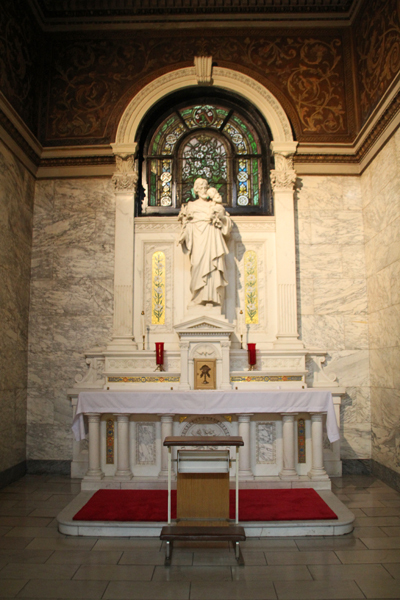 St. Philip Benizi, O.S.M.Chapel / Our Lady of Sorrows Basilica, Chicago. Directly across from St. Juliana Chapel is St. Philip Benizi Chapel. 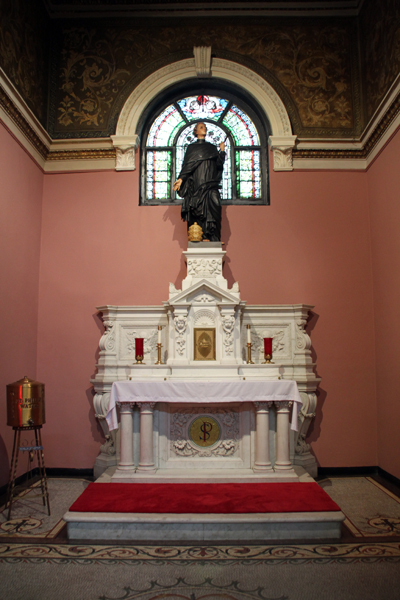 it is erected in honor of the great saint of the Servite order. According to legend, St. Philip was offered papacy, but humbly refused. 14. St. Anne, Mother of Mary Chapel / Our Lady of Sorrows Basilica, Chicago. This chapel was the first of the ten side chapels in the bascilica to be completed and contains the oldest altar in the building. It was also the first to employ stained glass window as a significant part of altar piece. here the window forms a “niche” in which stands the statue of St. Anne and the Mother Mary. 15. St. Therese of Lisieux Chapel. 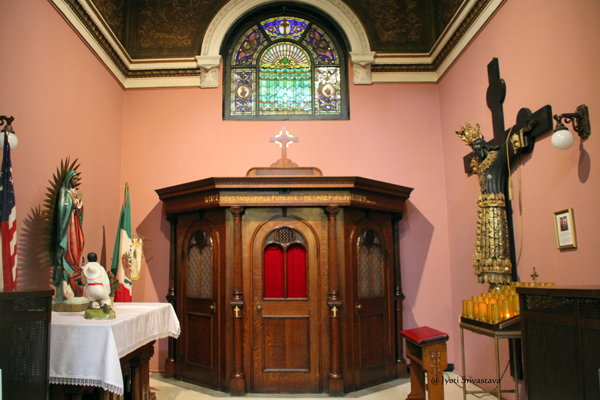 “The Little Flower” Chapel / Our Lady of Sorrows Basilica, Chicago. The Chapel was completed in 1933. The major decoration motif, appropiate for the saint called “The Little Flower” is roses. They are seen in the arms of carved angels, in altarpiece, in the stained glass window and in colorful Venetian mosaic. 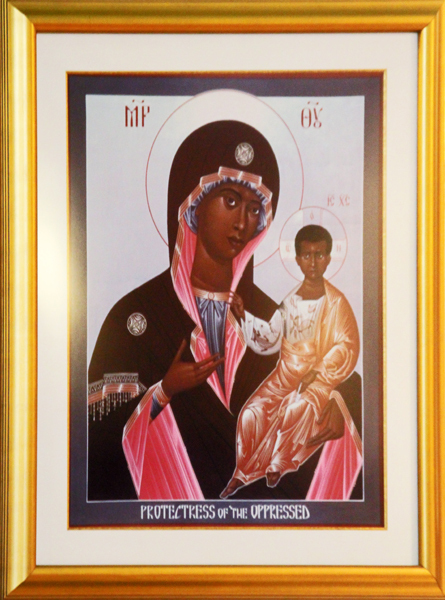 Just happy to be a parishioner of Our Lady of Sorrows since May 1st of 2015 when I became 60 years old. I think it is God’s Will that we attend MASS in this church. When we moved to the west side, I didn’t know that the Basilica was only 6 minutes drive from our home. We used to attend MASS at St. Mary of the Angels Church in Hermitage and Wood for seven years. One Sunday, I picked up the Catholic Newspaper on the floor at St. Mary of the Angels Church and when I got home, I read the paper and I saw the invitation in connection with the feast day of St. Peregrine in May of 2015. So, we attended the Feast Day of St. Peregrine two years ago. Since then, we decided to become parishioners of this church. We love coming to this church to comply with our holidays of obligation and other special days in our lives to thank God. Praise the LORD!